I haven’t been having too much luck with the WoD beta of late. The servers seem to crash after I’ve been on for a few minutes, so I’m not had much chance to explore (though I did get a good 10 minutes doing the quests as you come through the Dark Portal – some good stuff there!). So whilst I don’t have much info in the way of Shaman changes, I have been finding some fun new things that (I think!) will make playing just that bit sweeter. I’ve already gone through the Toy Box, today I’m bringing in what could easily be the best thing in the game – Summing random mounts. I have a few mounts (121 so far – still a ways to go!). And I’ve been quite fortunate to score a few rares, too. So it pains me to play favourites and have only 1 or 2 on my bars for quick mounting. But thanks to Blizzard, I don’t have to feel guilty about it any more! 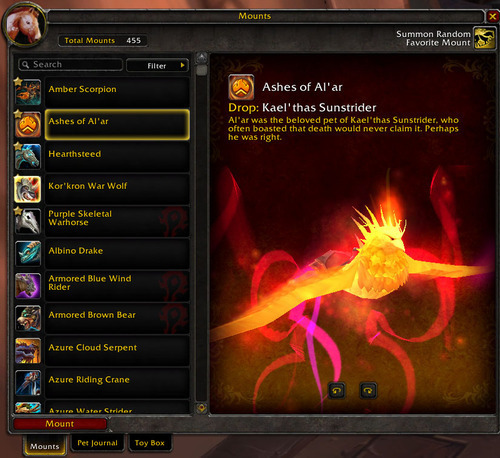 Within your mounts tab, you now have the option to add mounts to your favourites list. Just right-click on the mount you want to add, and click Set Favorite. From what I’ve seen so far, you can set quite a few. I managed to add about 28 to my list before the servers booted me out. So you shouldn’t have to ignore too many of your children! Once you’ve added the mount to your favourites, they will appear at the top of your Mounts list, and will have a gold star on them. And that’s it! Click that little yellow horse icon on the top right corner of your Mounts list and a random mount will be under you in no time! (well that sounds worse than intended). To make things easier, you can drag that yellow icon on to your action bars so you don’t have to open the Mounts list all the time. I like this little feature. If possible, I’ll probably add all of my mounts to my favourites list – I think it will be a lot of fun seeing more of the mounts I’ve collected over the years but never used for whatever reason. How many favourites will you have?